Fred Patacchia Jr. improved on his second-place finish in last year's Xcel Pro by winning the event at Sunset Beach yesterday. It could just be that pro surfer Fred Patacchia Jr. is at his best with his back against the "wall." Yet again, he demonstrated that he's extremely comfortable in this position in the final of the 21st annual Xcel Pro at Sunset Beach yesterday. The only goofy-footed competitor -- surfing with his back to the waves -- he came through for the win and his second victory at the event in three years. What's more, the 22-year-old from Haleiwa also made the prestigious Xcel final last year, and though he didn't win, he only came up one spot short as the runner-up. "I've always wanted to do well (at Sunset)," Patacchia said. "One of my favorite surfers, (former two-time world champion) Tom Carroll, used to do really well out here and he's a backsider as well. And I kind of just want to follow in his footsteps a bit. And my dad always really pressured me into surfing Sunset, Pipeline, and Haleiwa as well. He always said, 'If you can surf Sunset, you can surf anywhere.'" Sunset's right-breaking waves were in the 8- to 12-foot-face range with occasionally bigger sets for the last day of the three-day event. The Xcel is a 3-star World Qualifying Series contest and also the first major competition for Hawaii's big-wave season each year. 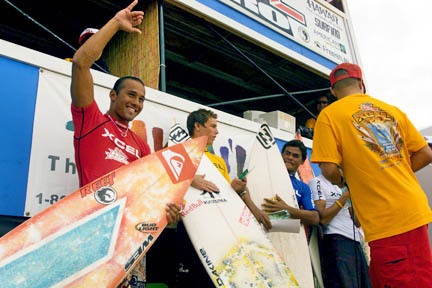 An international field of 140 surfers participated. Going into the Xcel, Patacchia was already ranked No. 16 in the WQS and positioned well to qualify for the elite World Championship Tour for the first time next year. He picked up $7,000 for the win and even more momentum heading into the final two major WQS events. While yesterday's result didn't significantly alter his position, "I think I'm just really realizing how to surf heats these days -- and how to win," Patacchia said. "That's helped me out a lot. I think my surfing's maturing. I've been really focusing on what to do in heats, and my boards and maneuvers ... really working on wave selection. ... It's kind of the confidence you need to put in yourself, and know you can win." Fred Patacchia Jr. acknowledged the crowd after winning the Xcel Pro yesterday. Patacchia received a total of 13.83 points (out of 20 maximum) for his top two waves in the four-man, 40-minute final. On the first of these waves, about 8 minutes in, he executed a backside snap before going into a huge off-the-top maneuver where he had to float down over the sizable wall of white water . He received 5.83 points for that wave, and then received an 8.00 about 7 minutes later for starting another ride with that same big off-the-top move, and then following with three more strong carves. The other three finalists were also from Hawaii, as Makaha's Brian Pacheco (13.70) finished just behind Patacchia in second place, Maui's Ian Walsh (12.93) took third and Kauai's Dustin Barca (11.66) was fourth. Pacheco, 28, received the highest heat score of the day, tallying 16.33 in winning one of the quarterfinals. After notching a 7.50 wave only 8 minutes into the final, he was very selective and patient in choosing his next rides, but came up with just a 6.20 as his next-best score and .13 overall short of Patacchia. "I felt pretty good all day, and I had a good board riding it the last two days of the event," said Pacheco, who won $3,500. For the final, "there were a lot of waves coming in, but not a lot of good ones. So I played the cards and gambled and sat outside, but not too much came in." In making his first final in a major pro event in Hawaii, Walsh took out defending champion and North Shore veteran Pancho Sullivan during the competition on Saturday. "I've been trying to do good here for a few years now, and I'm stoked to break through that shell and get through the semis. It means a lot to me to make a final here," said Walsh, 21, of Kuau. Also yesterday, the Big Island's Ned Snow earned $1,000 for winning the longboard Expression Session. The next big surfing events in Hawaii are the Vans Hawaiian Pro for the men and the Roxy Pro for the women, both at Haleiwa on Nov. 12-24. These events mark the start of the Vans Triple Crown of Surfing and are followed by two Triple Crown events for the men and one for the women to finish the season.